It’s 1997 in the Hill District of Pittsburgh at Court Theatre and Harmond Wilks (Allen Gilmore) is running for Mayor. 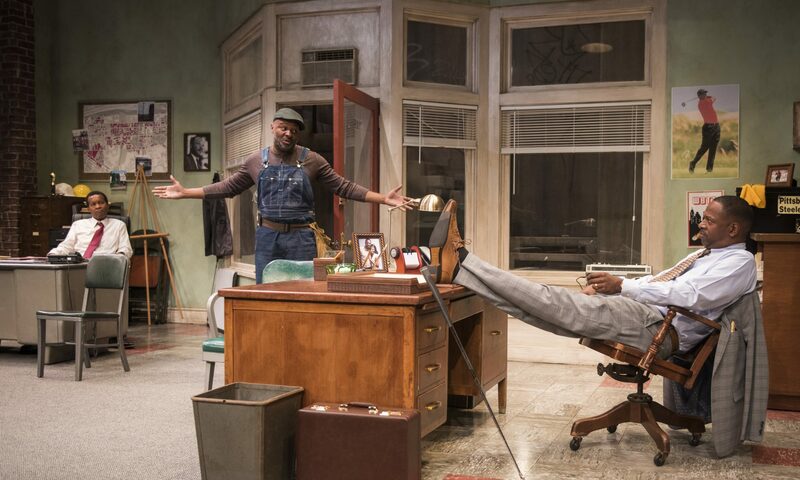 Radio Golf transforms the Court Theatre into an authentic depiction of a small office and its’ surroundings. The detail remains strong from the graffiti on the billboards to the discoloration in the ceilings. This set makes me feel at home in a place I’ve never visited, the raw attention to detail really captures the true essence of places we hear about but never see, such as the parking lot or infamous Aunt Ester’s home. Radio Golf is final play of the Wilson Century Cycle, both in terms of when it was written and where it lies chronologically in the series. This means that the world of Radio Golf is rich with the invented history of Wilson’s Pittsburgh. Before this show even takes off, the introduction music (sound by Christopher M. LaPorte) has already gotten me feeling some type of way, and it doesn’t end there, every interlude or so of 15 seconds washes the audience over in a wave of nostalgia, allowing you to be pleasantly surprised for what awaits, which is usually funny and oddly applicable to today’s the times. Politics will never not be irrelevant, everything is/can be political in nature, especially a play about a black man running for mayor in 1997. In addition to the campaign Wilks is running with his wife Mame (a grounded Ann Joseph), he is trying to build a complex in the fictional Hill District of Pittsburgh where Wilson’s Cycle takes place. The proposal includes all the businesses you see taking over today: Starbucks, Whole Foods, Barnes and Noble – well maybe not so much that one anymore. The story takes a twist Alfred Wilson Barlow, who shares a surname with another significant Wilson character in Gem of the Ocean comes in to the office to contest the bulldozing of his house, and the battle of wills begins. I had my hesitations about seeing the show, having studied Wilson previously. I didn’t know if this specific narrative would be able to not only capture but then maintain my attention. I was pleasantly surprised to find that Wilson had inserted a funny every other line or so, though some of the humor went over my head, this could possibly be a matter of age as the audience seemed to enjoy quite a few laughs. Throughout the duration of this production we see Harmond Wilks, a man who is used to doing what he is told, find the gall to stick to his gut, even if it might cost him in the end. Radio Golf is a noble tale at its’ core, and Wilson veteran Allen Gilmore executes this struggle with undeniable passion, carrying out moments that seem to surprise even himself. His partner in the development plan is the VP of Mellon Bank, Roosevelt, played by a suave and suavely dressed James Vincent Meredith. One of the really impressive moments in the show was when James was golfing in their office and hit a particularly difficult putt – the audience actually gasped in surprise when he made it. Roosevelt, who is.working his way up as “the white man’s whore”, as one character later s puts it, is another figure trying to persuade Wilks to follow the path, in addition to his wife, Mame. At some points it seems everyone is against Wilks as he is forced to choose between not only wrong and right, but the type of Blackness he is willing to employ to achieve the agenda he chooses to support. The costume design by Rachel Anne Healy is very stylish, showing us 90’s looks but in simple ways, like all the bright colored lining matching in Roosevelt Hicks’s impeccably tailored suits. Equally outfitted was Ann Joseph’s Mame, who was given sharp power suits that make her look like a woman who could have anything she wants. Joseph performs a beautiful monologue about the importance of a woman’s identity, and makes you wish there were more stage opportunities for her character. Sharply directed by Ron OJ Parson on Jack Magaw’s detailed and nostalgic set, Parson smartly updates this production of Radio Golf as unlikely relationships form in this story about taking a chance, risking it all, and finding family in the strangest of ways. Radio Golf Runs Through October 6th at Court Theatre. Featuring: James T. Alfred, Allen Gilmore, Ann Joseph, James Vincent Meredith, and Alfred H. Wilson.